I have fond memories of controlling one of the radios in a 1959 KPFA broadcast of John Cage’s Imaginary Landscape No.4 for 12 radios, 24 players and conductor. Our highly successful performance was repeated two days later in the University’s Hertz Hall. Unfortunately, no one had checked out the reception. In the event, the steel and concrete structure proved to be an impenetrable barrier to radio waves, producing an extended aleatory performance of Cage's silent 4’33”. Half a dozen years later, Charles Shere's 1965 KPFA program, John Cage Considered, included a recording of the first performance. 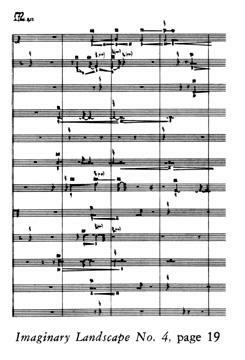 This had taken place at the McMillan Theater, Columbia University, on May 2, 1951, and was conducted by the composer, in full dress. (How many times in his career did this happen?!) 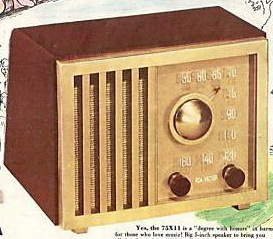 The radios used were not tinny little portables, as in many later performances — they were RCA 'Golden Throats' [left] with the deep-throated presence that only a wooden speaker enclosure can provide. Cage saw them in a shop window and, persuasive as ever, got the manager to lend him 12 for the premiere. The process of the work's composition is described in his seminal essay collection, Silence. We know from earwitness reports that the public performance took place at the end of a long concert, well after midnight. By then many stations had gone off the air, and so the sonic texture is rather minimalist, though not a mere mime show like the Hertz Hall performance. During the rehearsal earlier in the day there had been a lot more going on. In the early 60s I acquired second-generation recordings of both the rehearsal and the performance. (I lent them to Charles Shere for his KPFA broadcast.) They are on 78 RPM discs, apparently transcribed directly from the originals at a New York studio. One of my fellow dial-twiddlers in 1959 was the glamorous Carol Lienhard. A few days ago (August 8, 2009) I got an e-mail from her telling me that the work was to be performed that very evening in the Tate Gallery, London. I dropped everything and hurried along, camcorder in pocket, arriving in time for the second performance (see below). The director proved to be Robert Worby, with whom I had worked many years before. (It was his article in the Guardian that Carol had forwarded to me.) They strove nobly against an ambient noise level so high as to reduce most of the sonic output to a relative ppp. Later he e-mailed me an mp3 of the first performance, which, it developed, was from my own copy which he had extracted via the radiOM internet archive from Charles Shere's KPFA program of forty years before. Six Degrees of Separation, reduced to one.